For some CTD casts, the down-welling PAR channel was considered to contain only null data and was subsequently deleted from these series during processing at BODC. Data were likely null due to measurements being made in low light levels (eg. dusk/night time) or the sensor being removed from casts greater than 1000 m.
The quality of measurements obtained with the Satlantic ISUS UV in-situ nitrate sensor were considered highly unreliable by the data originators and it was suggested that these data should be dropped from the series. It was confirmed that these data were questionable following in-house screening at BODC. Since the data were not fit for future purpose the channel was deleted from the series. 1The primary temperature and conductivity sensor pair (described here) are referred to as secondary sensors in all files produced from Sea-Bird Software processing. The names were swapped during NOCS PSTAR processing where the Sea-Bird named, secondary sensors became the primary sensor pair. 1Fofonoff N.P. and Millard R.C., Jr. (1983). Algorithms for computations of fundemental properties of seawater. UNESCO Technical Papers in Marine Science No. 44., 53pp. 2Benson, B.B. and Krause D., Jr. (1984). The concentration and isotopic fractionation of oxygen dissolved in freshwater and seawater in equilibrium with the atmosphere. Limnology and Oceanography, 29:620-632. A total of 84 CTD stations1 were carried out during the cruise in the areas of the Extended Ellett Line and Icelandic Basin. From these, a total of 92 CTD downcast profiles of 2 decibar data were collected2, of which, 75 profiles were obtained using the instruments associated to the stainless steel CTD. Using this unit, 21 profiles of data were collected as part of CTD survey 1 (C1), 3 as part of CTD survey 2 (C2), 16 as part of SeaSoar survey 1 (S1), 30 as part of SeaSoar survey 2 (S2) and 6 profiles of data were collected in the area of the Extended Ellett Line. General information regarding CTD sampling strategy can be found in the cruise report from p137. 1Please note that a total of 84 CTD 'profiles' were reported to have been carried out during the cruise on p137 of the cruise report, however, this actually refers to the number of CTD stations visited during the cruise. 2Please note that the collection of 94 profiles was attempted during the cruise but data were corrupted from cast 16220A and the CTD malfunctioned during cast 16295A. Therefore, only 92 profiles of data were collected. Raw CTD files were initially processed through Sea-Bird software (SBEDataProcessing-Win32) using a modified protocol from Discovery cruise D306. The resulting files were then processed through NOCS Unix scripts into PSTAR format using slightly modified versions of execs used on cruise D306. Separate NOCS Unix scripts were used for stainless steel unit casts and titanium unit casts. Full processing details can be found in the cruise report from p138. Marine biogeochemical cycles are the key processes that control the cycling of climate-active gases within the surface ocean; the main transport mechanisms governing the supply of nutrients from deeper waters across the pycnocline; and the flux of material to deep water via the biological carbon pump. 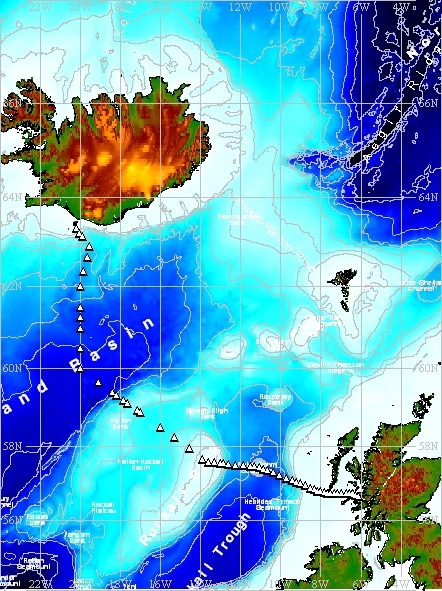 The broad aim of this Theme is to improve knowledge of major biogeochemical processes in the surface layer of the Atlantic Ocean and UK shelf seas in order to develop accurate models of these systems. This strategic research will result in predictions of how the ocean will respond to, and either ameliorate or worsen, climate change and ocean acidification. The emphasis behind this Work Package is to gain a better understanding of the ocean's biological carbon pump (OBP), an important process in the global carbon cycle. Small changes in its magnitude resulting from climate change could have significant effects, both on the ocean's ability to sequester CO2 and on the natural flux of marine carbon. This work package is concerned with the effect of physical processes and circulation on nutrient supply to the euphotic zone. Many physical pathways influence nutrient supply, such as winter overturning, Ekman pumping, small-scale turbulent mixing and mesoscale ageostrophic circulations, (of which, eddy pumping is but one example). Increased stratification will change patterns of winter overturning and dampen small-scale mixing. Shifts in wind patterns will perturb Ekman pumping. Changes in gradients of ocean heating and wind-forcing will alter the distribution of potential energy released through baroclinic instability of eddies and fronts. The combined effect of change on total nutrient supply will therefore be complex. Such physically-mediated changes, coupled to changes in aeolian dust deposition, may profoundly alter upper ocean plankton communities, biogeochemical cycling and carbon export. Aspects of this work will link to Oceans 2025 Theme 9 and 10, and Theme 2 WP 2.6.